Undoubtedly, one of the greatest spectacles of nature is a starry night. Moving away from the glow of cities and towns, we can still find places with a black sky background and thousands of stars visible to the naked eye. First they seem immutable, points of light that seem not to move… but suddenly, without warning, we see what looks like a star falling at full speed towards the horizon. The phenomenon happens so fast that we don’t have time to tell the person at our side: we have just seen a shooting star. On any given night, depending on our luck, we can see between one and two shooting stars per hour; but on certain dates they occur much more frequently and many more can be seen: when this happens we call it a meteor shower. In August 2018, starting from about the 5th, you’ll be able to see more and more shooting stars per hour each night, until the 11th and 12th when the maximum activity takes place. From then on the frequency decreases, until about the 29th when it finishes completely. This is the Perseids meteor shower. The best nights to observe them are usually those of August 11th and 12th, with a forecast for this year of 100 shooting stars per hour, a number that is also called the Zenithal Hourly Rate (ZHR), which is an estimate for perfect conditions. This number refers to the quantity of shooting stars across the entire sky, with perfect sky conditions, without light pollution and for an experienced observer without any vision problems, whose eyes are also able to take in the whole celestial sphere at once. Although this is impossible, the usual case, being realistic, is that one can see between 10 and 20 per hour, which isn’t bad at all. Shooting stars must be observed without binoculars or telescope—it would be impossible to aim fast enough. It’s an event to watch with the naked eye. The better the sky (darker), the more shooting stars you’ll see. For this we must move away as much as possible from the light pollution of the population centres. It’s a show that lasts for hours, so taking a folding chair or lounger will help make it more comfortable. And taking into account that the temperature drops at night, wearing warm clothes is essential almost anywhere. They seem to fall all over the sky, but more shooting stars are seen near the constellation of Perseus, which is visible in the northeast zone of the sky—both for the northern and southern hemispheres—so it’s there you should focus your observations. The time is important. The best hour is just before sunrise, with the constellation of Perseus high above the horizon and our sky window circulating in the opposite direction to the meteor stream. While the time is important, it’s not definitive. For those who can’t stay up so late, there’s an option to go out and hunt them earlier in the evening and you’ll only miss a few meteors per hour. What’s more, this year the Moon’s shine won’t affect us much because it’ll only be seen for a short while, just before sunset. 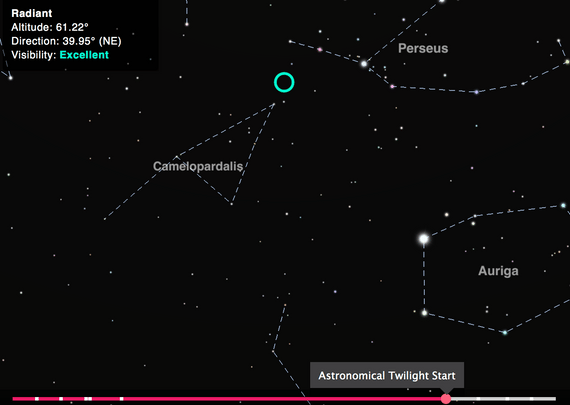 A mobile phone app or a sky guide will help you to recognize stars and other objects in sight. Despite looking like a kind of dying star, meteors like those of the Perseids are not stars. In the space between planets, within the solar system, there are different types of objects: asteroids, comets and also dust. 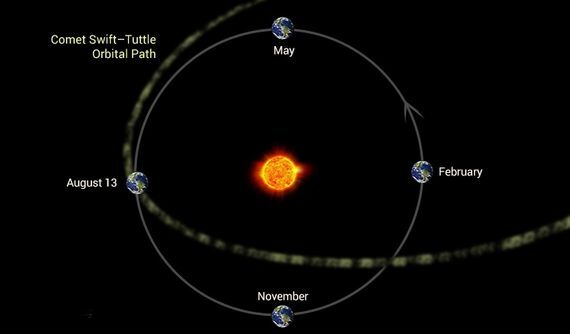 When the Earth crosses their path as it travels around the Sun, it’s like when an insect hits the windshield of a car at high speed: these dust particles enter the atmosphere at about 50-60 kilometres per second and from that moment on we call them meteors. The impact is brutal; the air in front of the meteor is compressed so hard and so fast that it heats up to thousands of degrees Celsius and the meteor begins to shine while breaking up—that’s the moment when, from the Earth’s surface, we see a shooting star. Returning to the simile of the car windshield, there is a zone where these meteors impact, in the same way as the insects hit the car; this area is the constellation of Perseus. Looking through our star window towards Perseus (northeast) we will be pointing directly towards the direction of Earth’s advance in its orbit; and if we look towards the opposite point (southwest), it’s like seeing the rear window of the car: we won’t see any squashed insects there. The solar system has its own cleaning mechanisms. In a few thousand years, the Sun clears all the dust from our space neighbourhood, either by trapping it with its enormous gravity or by pushing it out of the system with the pressure of its light. That’s why it’s necessary to have a constant source that generates new dust so that we can enjoy shooting stars, and these polluters are comets. Looking at a picture of a comet, we can imagine why: its showy tail is largely made up of gases, but in its trajectory it also leaves behind a trail of fine dust. When there’s a meteor shower, what happens is that the Earth passes through an area that a comet long ago dirtied with dust from the ejections of its tail. In the end, one of nature’s most beautiful phenomena is nothing more than comet dust, which burns up as it enters our atmosphere. The Death of a Planet. Live!